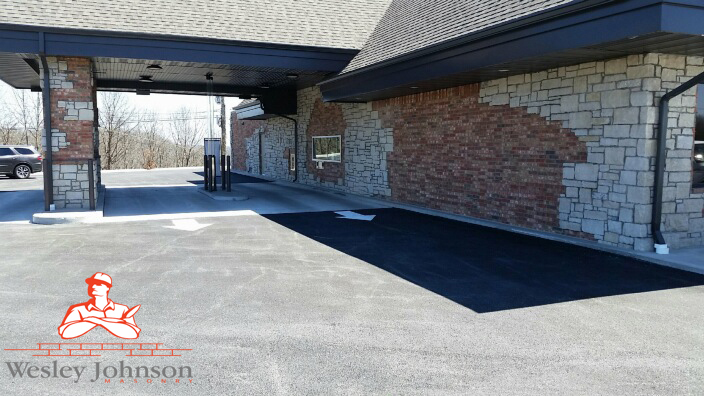 Wesley Johnson Masonry recently completed their second commercial masonry project for Table Rock Community Bank in Stone County just outside of Branson & Springfield, Missouri. This beautiful brick and stone structure was designed by both the builders and owners. This lastest branch of Table Rock Community Bank, located at 19014 Business 13 in Branson West, Missouri, marks the banks second location as well as their latest collaboration with Wesley Johnson Masonry. Our company also oversaw the stone and brick work of the banks location in Kimberling City. 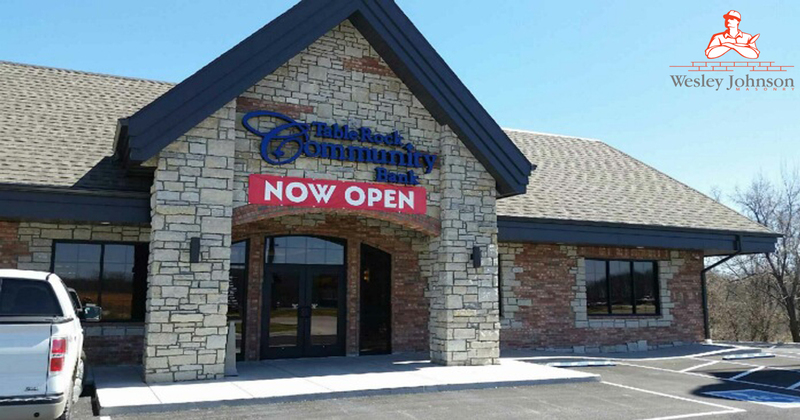 There are many reasons why businesses like Table Rock Community Bank and others are choosing stone and brick masonry for their builds. Branson masonry construction buildings like those that Wesley Johnson Masonry have completed in Branson & Springfield are fire resistant as well as weather resistant. That’s a big plus here in the mid-west. The energy saving benefits of brick and stone construction are considerable as well. Brick and stone store energy, keeping your building warmer in the winter and cooler in the summer, which can lower energy bills considerably. With all of these pluses of brick and stone masonry, many insurance companies offer substantial breaks for business owners looking to masonry for their builds. Not to be forgotten is the timeless look of stone and brick construction. There is a certain, intangible, quality to such structures. A stone or brick building conveys strength. Remember the Three Little Pigs? Wesley Johnson Masonry builds structures that are aesthetically pleasing, built to last, and offer real, long term, savings for their clients. If you find yourself in Branson West or Kimberling City, stop by one of the Table Rock Community Bank locations and take a look at what Wesley Johnson Masonry can do.